Top Picks from the Glasgow Film Festival 2018 | Take One Action! The Glasgow Film Festival is back for its 14th year, bringing an exceptional programme of documentaries, fiction films, events, talks and industry events to Glasgow from the 21st February – 4th March. With so much to choose from we have done the hard work for you and selected our top picks from the festival – with a Take One Action focus towards international cinema that explores issues of social and environmental justice and celebrates the people changing the world. So… what are you waiting for? Dip right in. Click on each film’s image to watch its trailer – links below the synopsis will re-direct to the ticket booking page. It is less than 50 years since women in Switzerland secured the right to vote. The Divine Order offers a thrilling, hugely entertaining sense of this defining moment through the lives of the women in a small Swiss village. Housewife Nora (Marie Leuenberger) lives with her husband, two sons and father-in-law, but if she wants to work she would require her husband’s permission. Fighting such an outmoded notion, she starts campaigning for women’s right to vote in a film that has delighted audiences and become Switzerland’s Oscar contender. In the summer of 2016, thirteen Syrian refugee women left their lodgings in Jordan to tour the UK with their own adaptation of Euripides’ great anti-war play, The Trojan Women. Backed by London’s prestigious Young Vic Theatre, the women weaved their stories of exile and loss into the play. Alongside behind-the-scenes footage, we hear first-hand why this play can help people better understand what it means to be Syrian today. Followed by a screening of Queens of Syria and a post film discussion focusing on the UK refugee condition and the state of international mobility. Irish animator Nora Twomey (The Secret of Kells) makes her solo feature debut with this exquisite, heartrending adaptation of Deborah Ellis’s beloved novel. When the Taliban rulers of Kabul imprison a teacher, his 11-year-old daughter Parvana (Saara Chaudry) disguises herself as a boy and becomes the family’s sole breadwinner. Executive produced by Angelina Jolie, this is a stirring tale of family, friendship and survival, with an imaginative range of animation techniques and a score partly recorded in Kabul using traditional musicians. Martine Syms is a Los Angeles-based artist whose work examines representations of blackness and its relationship to narrative, vernacular, feminist thought, and radical traditions. Her new feature-length film,Incense, Sweaters & Ice, is a powerful exploration of the underlying oppressive racial structures in the United States, and their origins. Interweaving biographical narratives with fiction, this multi-location narrative follows routes of the 20th-century Great Migration of African-Americans from the rural South to the Northeast, Midwest and West. Since 2015 the current refugee crisis has flooded every news and media outlet across the globe. Another News Story takes a unique approach to capturing this narrative. While still giving a groundfloor perspective of migrants fleeing Syria and Turkey and their struggle to find a country where they are welcome, director Orban Wallace simultaneously turns the camera on the journalists and the role they play in representing the crisis to the world. Wallace’s gripping debut feature raises important questions about what happens behind the camera, and how the life cycle of a news story starts and grows. Revisiting elements of his own experience, Robin Campillo has created a bustling fresco of the personalities and politics of the ACT UP Paris LGBTQI community during the 1990s. The sense of urgency, authenticity and attention to detail is exemplary as individual stories come into sharper focus. We follow hot-headed Sean (Nahuel Pérez Biscayart) as he falls under the spell of gravely handsome newcomer Nathan (Arnaud Valois). A moving, lump-in-the-throat love story is matched by a celebration of the power of activism to awaken an indifferent world in this superb drama. In 1974 a group of workers at the Rolls-Royce factory in East Kilbride showed their support for the people of Chile by refusing to carry out vital inspections of engines for Hawker Hunter planes – the fighter jets were being used by the military junta against the people. The boycott endured for four years but the Scottish workers never knew what impact they had; it was a matter of conscience and an act of solidarity against General Pinochet’s brutal dictatorship. 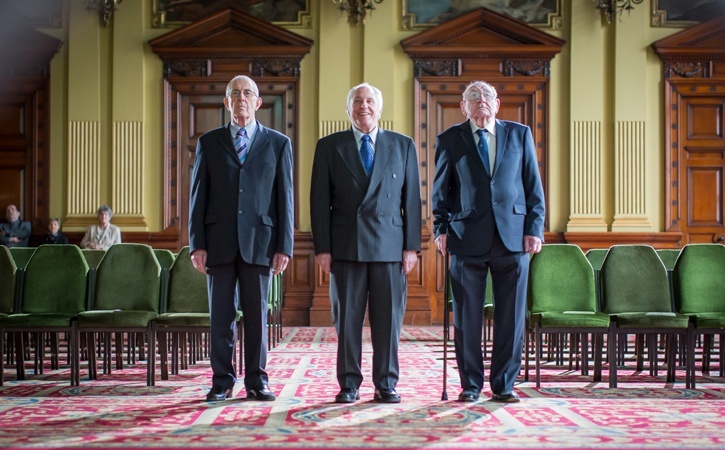 Forty years later, Nae Pasaran reunites inspirational figures Bob Fulton, Robert Sommerville, John Keenan and Stuart Barrie to hear their story. It also ventures much further to detail the horrors of the Pinochet years, meet survivors of the period and hear the Chilean side of the story. Expanded from an award-winning 2013 short, Sierra’s rousing, deeply emotional documentary reveals the real difference these men made – and celebrates the power of acting on your beliefs. All film copy taken from the Glasgow Film Festival website, with thanks.